HALIFAX -- A teacher who co-authored an independent report on inclusive education in Nova Scotia says students with learning challenges cannot succeed under the current program, which is why more funding is needed to transform the province's approach to education. 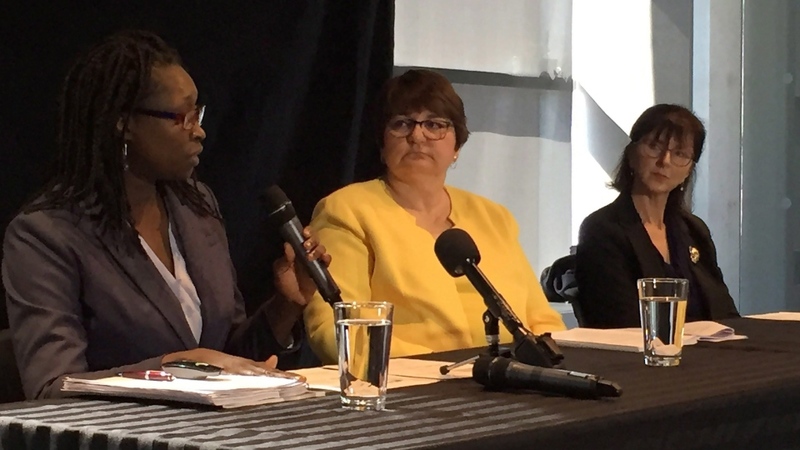 Adela Njie, one of three commission members who spent a year drafting a five-year plan for reform, told a news conference Monday there weren't enough supports in place to help one of her students, who rarely came to school because of severe anxiety. "There are numerous examples of students who today are not able to be successful because we have a rigid program," she said. "This is why we need a new model: to meet the needs of the students when they need it and where they need it." The commission estimates about a third of the province's 118,000 students need some form of support at school. Their 124-page report recommends more funding for psychologists and behaviour support teachers, and calls for faster student assessments and behaviour intervention. The report also recommends increasing funding for inclusive education over five years, with the province spending $70 million to $80 million annually by year five, a seven per cent increase for the Education Department's overall budget. It also recommends hiring 30 behaviour support teachers, 12 school psychologists and 12 regional health nurses this September, as well as paying for 400 school psychology and 200 speech-language pathology student assessments. In total, the report recommends hiring between 600 and 700 more specialists by 2022. Nova Scotia's inclusion policy requires the province to make sure students with special needs are given support to succeed in a regular classroom setting. It's been 20 years since the policy has been reviewed. That's why the commission is calling for an updated policy and short-term fixes to help priority students in the upcoming school year. The commission was charged with producing the study in the wake of a bitter labour dispute last year between the provincial government and 9,300 public school teachers. When the province introduced a bill to impose a collective agreement, many teachers came forward to suggest the inclusion policy wasn't working. Some made emotional pleas about violence in classrooms and having to deal with 30 students with vastly different needs. Education Minister Zach Churchill said the government has broadly accepted the objectives in the report, but he said flexibility will be required as it works with its partners, including the Nova Scotia Teachers Union. He acknowledged that implementing the short-term recommendations will be a challenge because there aren't enough specialists to fill the positions. "In Atlantic Canada, there's actually a deficit in those specialist positions," Churchill said. "We have to work with our post-secondary partners to ensure that we're producing more graduates to meet those needs." Churchill said the government has already established a bachelor of education steering committee with the post-secondary schools that offer the programs. The government earmarked $15 million in last week's provincial budget to help implement the report, which Churchill said is in line with the commission's recommendations for this year. Teachers union president Liette Doucet said the union came up with the idea for an independent commission after concerns were raised by teachers and others. "In many ways, today's report validates the stand that teachers have been taking over the past two years," Doucet said in an emailed statement. "It is clear they conducted a full and thorough consultation and have captured the concerns teachers, parents, students and stakeholders have been voicing now for several years." The report also recommends setting up a "multi-tiered system of supports," saying 80 to 90 per cent of students get the help they need to succeed, while five to 10 per cent need more targeted help, and one to eight per cent need more intensive interventions. It said similar models have worked in Nunvut and Saskatchewan.